n00b squad - "Guaranteed to Rock"
At n00b squad, our minds are in the gutter all the time. Fortunately, Big Jeff’s mind is there more than most and therefore we have the third panel for this strip. Guitar Hero was one of the few games to require a peripheral and become successful. Why stop at one peripheral? The sky’s the limit as to what PS2 peripheral can be packed into a cardboard box given the right product placement and air holes. Pertaining to the game itself, I honestly haven’t read up on Guitar Hero 2 at all. Maybe I did once, but I can assure you that my mind flushed out all the information I gathered. I have only seen the video and heard tales of Tycho smashing his guitar controller while playing it on stage at PAX. 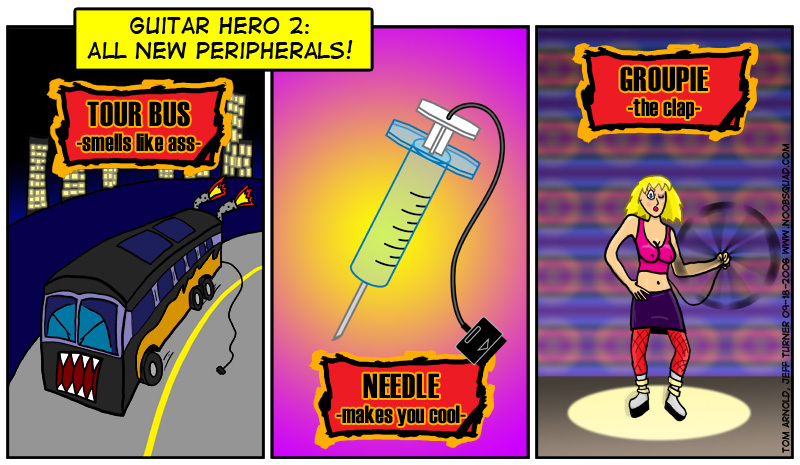 Guitar Hero 2 is one of those games that I can determine how awesome or awful it will be based on previous experiences. Fortunately, all it has to do is have new songs and a fresh coat of shiny paint and it will be another hand-cramping, face-scrunching, simulated rock fest spectacular. We're launching a new feature today at n00bsquad with the addition of a "Specials" section. The specials are intended for a series or timeline of comics that may have a different style than the regular batch that appear on the site. The first special is Andre’s classic Mario RPG series, a sprite based comic with Andre’s more “mature” sense of humor thrown on top. Head over to the first comic of the fourteen part series to see it. The special is completely done so there will be a new MarioRPG comic every week for the next thirteen weeks.